Edu Aid is Singapore’s preferred team of home tutors in Singapore, offering a range of tuition subjects right at home and known for creating a personalised touch. This one-on-one approaches allows for students to build on their personal strengths, discover their weaknesses and learn exactly how they can approach tests, assignments and future studies. Why Should I Consider Home Tuition in Singapore? Looking for tuition for your child? Are you bewildered by the sheer number of private home tuition agencies in Singapore? Do you fear that your child’s grade may not improve if they do not have a good tutor? Fret not! 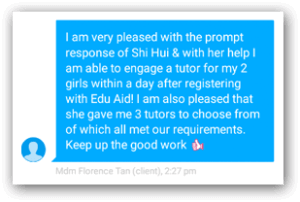 Edu Aid Tuition Services provides the best home tuition in Singapore for you! Edu Aid is a home tuition agency in Singapore that will help you to find the best tutor for your child according to their unique needs. It is generally agreed upon that much emphasis has been placed on academic success and thus, every parent would want the best for their child. This has led to the perception that one-to-one tuition incurs high financial cost. However, our agency shall find most appropriate home tuition teachers in Singapore that caters to your specific budget, allowing your child to have access to tuition. How Can Home Tuition in Singapore Help My Child? We provide services for all levels ranging from primary school, secondary school, and Junior College. This extends to international education such as International Baccalaureate (IB) and the International General Certificate of Secondary Education (IGCSE). Our tutors are specialised in subjects such as Maths, Science, English, Chinese, Tamil, and more. Our home tuition agency in Singapore strives to cater to the needs of all students. Though we can see the benefits of having tuition, some parents may feel that it is unnecessary to spend so much money on it. In actual fact, this small investment can actually create a bright future for your children in the long run – in our results-oriented society, our children have to perform well academically. Knowing this, our home tutors in Singapore ensure to provide the very best for your child. They patiently provide one-on-one guidance that will definitely improve your child’s grades. Do not neglect the importance of the 1-2 hours of tuition: it can help your child clarify any concept in school and consolidate all their learning. We are the most trusted agency, for private tuition in Singapore, and we promise to help each and every student towards academic success. Why Is Our Home Tuition Agency in Singapore The Best Choice? We nurture and provide the best home tuition in Singapore for every student that is registered with us, aiming towards academic success that can shape their future. From tutors for primary school students to secondary and JC physics tuition, our home tutors in Singapore are all experienced and knowledgeable in various topics, and have a firm understanding of various approaches and methods for learning. With a personalised approach tailored to each student, we welcome all children of varying levels, from those trying to get their grades up to those struggling to understand school concepts. If you’re eager to get your child started with us, request one of our home tutors in Singapore today, or get in touch with our friendly team for more information.